Creative is one of the most renowned brands when it comes to earphones and sound section. We earlier reviewed the Creative Aurvana In-Ear 2 Plus and now we have also got our hands on it's successor creative Aurvana In-Ear 3 Plus. Aurvana In-Ear 3 Plus are upgraded version of Aurvana In-Ear 3, even though both are very similar but there are some changes ofcource. Aurvana In-Ear 3 Plus comes in transparent hard plastic box. You can only see the earphones packed within on upper half and lower half of the box is covered by banner with Aurvana In-Ear 3 Plus and their specification. While opening it you might find it bit difficult since you have pull out upper part hard to open the box. Once you open it you can see the ear-buds are nicely attached to the plastic stand and below that you will find accessories, you will get earphones, different sized ear-tips, clearing tool, nice earphone carry case and an aeroplane adaptor with some user manual. 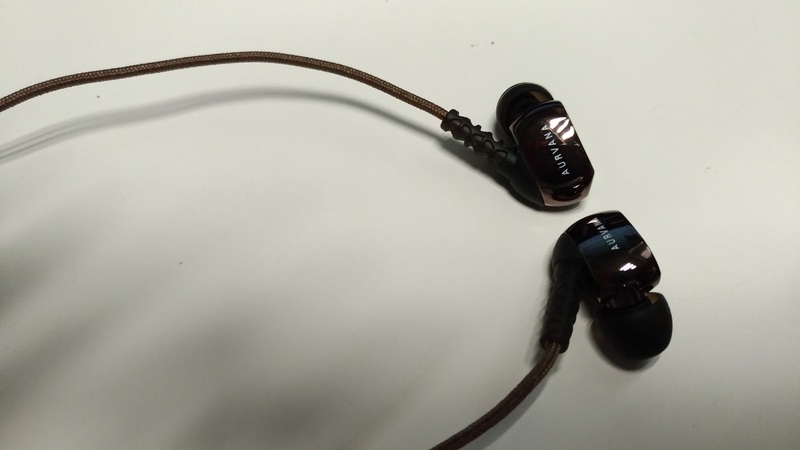 Design of Aurvana In-Ear 3 Plus is almost same and very much resemble to Aurvana In-Ear 3. Aurvana In-Ear 3 Plus looks very nicely design and attractive. Have nice build quality beside earphone cable are also quoted using braided fabric. The one we have received are in copper brownish colour looks very premium and nicely design In-Ear earphones. Finding perfect fit for you ears, since medium size comes as default size. If you used to use normal in-ear earphones then getting used to this type is bit hazy. So, overall quality is good but not best in their price range. It seems creative does some excellent job for manufacturing Aurvana In-Ear 3 Plus. 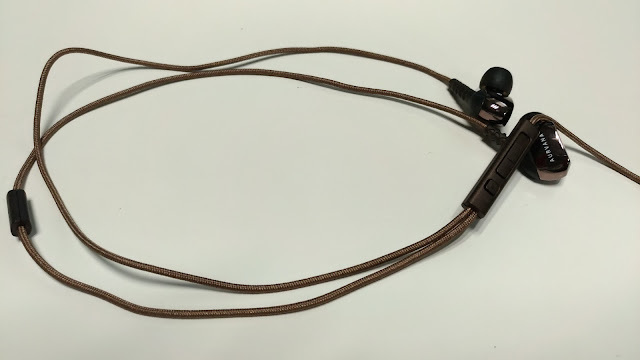 Aurvana In-Ear 3 Plus have 4.25ft long cable with quoted using braided fabric. Creative has provided single remote containing button along with volume slider. You can use the button for play and pause the music by single press and can forward the song using double tap. Volume slider comes very handy when it comes to controlling volume at various situations. One of the biggest advantage of this, you don't have take out your smartphone every now and then to adjust the volume. But we would recommend you not to listen to the full volume using volume slider. Beside earphone provide excellent sound quality during the call. Well on sound quality Creative did some excellent job where Aurvana In-Ear 3 were lacking. 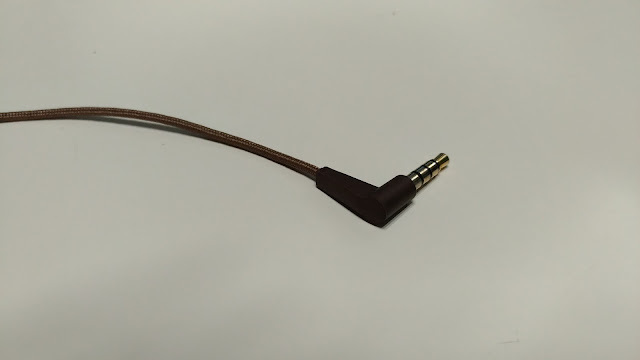 We have tested this earphone using many smartphones and music players, they perform well. If we talk about lows then sound quality on low bits are solid. You can hear the lows clearly but again it depend of level of bass used in soundtrack. Most of instrument and vocals have their sound under the mids in the song. They are very crisp and clear during our testing. In highs treble are controlled well, unlike in the Aurvana In-Ear 2 Plus treble are not controlled well so was bit disappointed. But here Aurvana In-Ear 3 Plus creative has rectify their shortcoming on previous versions. Still when we talk about bass Aurvana In-Ear 3 Plus is still lacking behind. The effect are not as expected but considerably good. So if we talk about overall sound and music experience Aurvana In-Ear 3 Plus perform very well just creative need to work on bass a little bit for reaching excellence. Active noise cancellation is very effective. While listening to music with perfect ear-fit you are hardly able to listen to outside noise. ﻿Here is all about Creative Aurvana In-Ear 3 Plus Review. If you have any question or any opinion about this feel free to share in comment below. Stay tuned for more. Thank you for reading.